Wash zucchini and drain well. Place on a cutting board, remove minimal amount off both ends and discard. Cut by hand or on a slicer and slice into 1/4 inch thick slices lengthwise. Place soda water into a stainless steel mixing bowl. Combine flour, cornstarch, 1/2 teaspoon kosher salt, pepper, oregano, granulated garlic, and add to soda water 1 cup at a time, incorporating with a whisk – do not over-mix. Batter should be the consistency of thin pancake batter – thin out if necessary with soda water. Dip each individual slice of zucchini in batter & allow batter to briefly drip off zucchini. Then dip zucchini in to Japanese Breadcrumbs, pressing into crumbs to coat well on both sides. Place onto a small sheet tray or baking tray lined with paper towels, and do not overlap. Dust the zucchini with the remaining Japanese breadcrumbs. 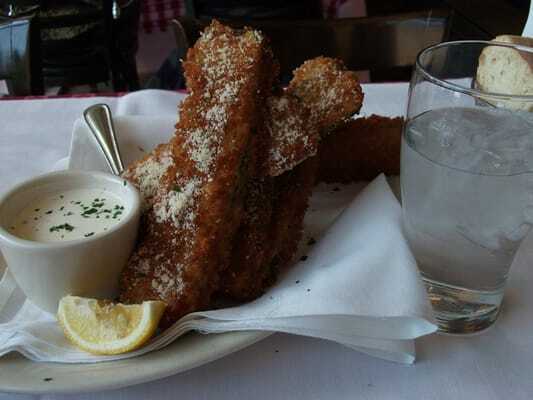 Place the breaded zucchini into 350 degree deep fryer for 3 to 4 minutes or until golden brown. Place zucchini onto a napkin lined sheet tray and lightly dust evenly with kosher salt, parmesan cheese, and romano cheese. Garnish with lemon wedge and chopped parsley. In a small bowl, place mayonnaise, 1 to 2 tablespoons fresh lemon juice, garlic puree and parsley. Season with coarse salt and ground pepper. Stir to combine.